I am going in full circle in finding the ideal 1:1 macro lens. I am about to embark on the journey with this macro lens after Sigma 105mm f/2.8 1:1 Macro non-DG version. Similar to Sigma, my Tamron is the non-Di version and I like it for the cheaper cost. When I get this lens, the MF/AF switch closely resembles that of the Sigma lens. And the MF switch on lens once again requires the body in MF mode and I lose the focus trapping method that I used to rely on. 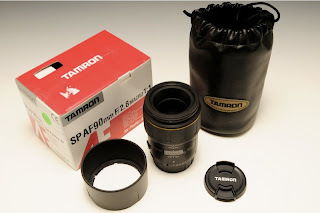 One caveat noted in Tamron is the extension of the lens front upon close focusing. I don't recall the long extension from the Sigma in close focsuing.